Amtrak 461, which has been sold alongside 20 other F59PHI locomotives to Metra. Photo: Steve Wilson. Metra has agreed to purchase 21 ex-Amtrak F59PHI locomotives for around $27.3 million (∼€22.1 million). The Chicago commuter rail operator is in the process of replacing its fleet of ageing locomotives – despite falling short of what it describes as the necessary funding. A request for proposals (RFP) was issued in December, 2017, for a base order of 12 new or 15 remanufactured locomotives, with options for more, but with those trains not becoming available until 2020 at the earliest, Metra’s board of directors has moved to approve the purchase of 21 locomotives to supplement its fleet. The F59s, which have been bought for $1.3 million each, will be in addition to the engines purchased under the RFP. 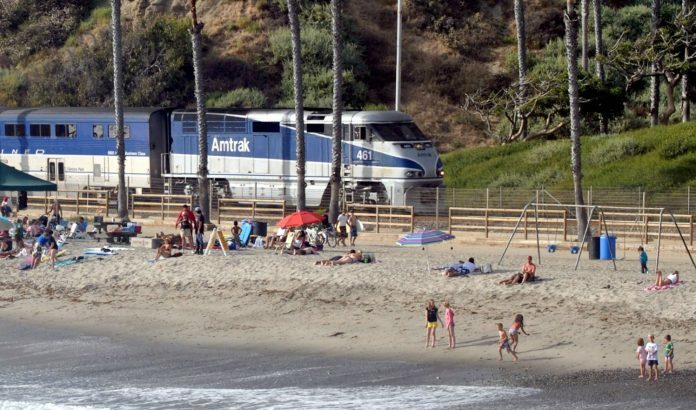 These locomotives were most recently used on Amtrak’s Pacific Surfliner service on the West Coast. The engines will become available this year as Amtrak switches to new Siemens Charger locomotives. The F59s were built by the EMD division of General Motors in 1998 and have been rehabilitated within the last five years. They have similar parts and operating characteristics to Metra’s existing fleet of EMD F40s. Metra said that it means they can be integrated quicker and without extensive and expensive training of maintenance and operating crews. It added that the F59s will also increase reliability, reduce pollution and achieve fuel savings of about 10 percent to 25 percent over the older engines.